Molecular sieves or activated zeolites are crystalline, porous aluminosilicates posing 3D uniform pore structures with definite diameters. They restrict the oversized molecules (molecular size above 3Å). The seperation purely depends on molecular size or polarity. Inner surface and penetrating substance are frequently interacting thus causing selective adsorption of polar substance at low molecular weight. For special technical applications these zeolites are used as molecular sieves. The term molecular sieve is only applicable to the surface of the zeolite which is like a sieve. The crystallographic geometry is due to tetrahedral structure of alumina and silica. 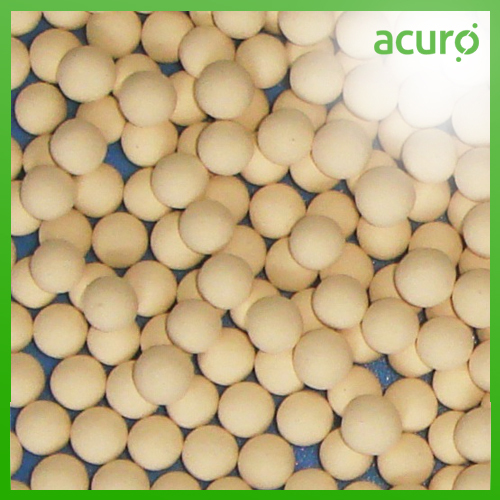 Conventionally known as alkali metal alumino-silicates, the 3A (3*10-10Å) form of molecular sieves are made by substituting potassium ions with inherent sodium ions of 4A molecular sieves reducing the effective pore size approximately to 3Å. The water of crystallisation is evacuated by heating, resulting in a vacant space or void. These voids are highly affable to re-adsorb water or any polar molecule. The enhanced internal surface area coupled with strong ionic force increase the adsorption of considerable amount of water/polar component. The mesh size decides the phase to be handled. Usually 4-8 mesh sieve is used in gas phase applications, while 8-12 mesh sieve is common in liquid phase applications. Known for their excellent drying capacity (even to 90°C), the profound applications include removal of gas/liquid impurities, drying of natural gas, reactive monomers (olefins), refrigerants, unsaturated hydrocarbons, refining polymers, desiccation in petroleum industries etc. Remove impuries from gases or liquids to extremely low ppm level. Adsorption of molecules (NH3 & H2O from N2/H2 flow). Medical Uses: Oxygen concentrators for respiratory therapy. incorporated directly into plastics packaging and used in desiccant dehumidifiers (dry boxes) to protect moisture-sensitive contents. Molecular sieves are added to protect products such as pharmaceuticals, batteries, film, fuel propellants, machine parts and electronic components.